NASA and Boeing are working together under a new Space Act Agreement to improve flight training and aviation safety using NASA’s synthetic vision technologies and Boeing’s 787 simulators. The research will test pilots’ awareness and reactions to unplanned situations. NASA research technical lead Kyle Ellis says the agreement opens the door to exciting new research opportunities. Pilots deal with more challenges than ever – higher levels of aviation traffic, bad weather and the addition of new challenges (such as unpiloted vehicles) into the global air space. “We want to equip them with the greatest intelligent flight systems available to be able to cope with all of these different adverse conditions,” said Ellis. Synthetic vision technologies can be part of that solution. It’s a powerful tool that can effectively negate the visual penalties associated with even severe weather in a clear, intuitive manner. The technology offers the potential to improve aviation system safety and increase the efficiency of aircraft operations. The pilots who will participate in these tests fly for Avianca Airlines in Colombia, and they’re something of an extraordinary test group. Typically, research study participants are highly experienced pilots with tens of thousands of flight hours logged. The Avianca pilots are a group of 24 junior pilots. They represent the changing face of global aviation. Testing at Boeing’s Miami training facilities will begin in late 2017. Today, Ellis and his research team are working with Boeing to test and certify synthetic vision systems for attitude state awareness. 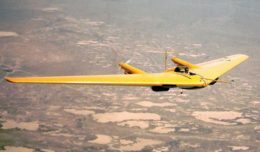 He sees it as a stepping stone toward a larger goal, anticipating a future in which technologies that give pilots vision far beyond what the eye can see. That kind of cockpit technology has a name — combined vision systems. A combined vision system is a merger of synthetic vision (i.e., systems that generate rendered environments in real time based on stored database information) and enhanced flight vision systems (i.e., displays that use forward-looking infrared systems and millimeter wave radar to give pilots a live look at the world around the aircraft). It can give pilots a best-of-both-worlds representation of the world and their orientation within it. Under stressful situations, it’s much harder for pilots to absorb essential information and execute the appropriate actions. 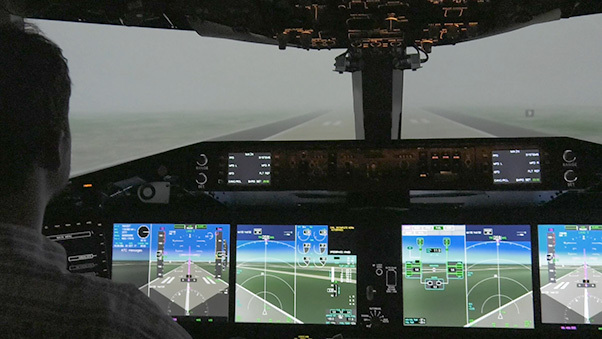 Synthetic Vision systems look just like the world outside the window, and that makes them more intuitive – more believable – for pilots. “Seeing is believing,” says Ellis. With this technology, pilots will be able to believe what they see, trust it and follow that to safety. Synthetic vision cockpit display in Research Flight Deck simulator at NASA Langley Research Center in Hampton, Va. The Space Act Agreement between NASA and Boeing supports the Commercial Aviation Safety Team, a partnership between the U.S. government and the aviation industry developed to reduce the commercial aviation fatality rate in the United States. NASA and Boeing are members. Space Act Agreements are, in a sense, strategic alliances. They are the primary vehicle NASA uses to partner with the external community, and they give NASA access to technologies and capabilities that are not in its core portfolio. These partnerships expand NASA’s ability to meet technical challenges, often at virtually no cost to taxpayers. As NASA advances its goals, Space Act Agreement partnerships can also advance the mission of our partners.